Researchers at the center pioneered the science informing much of the birds’ recovery to date, including assessing dietary needs, developing breeding methods and techniques for raising chicks, and preparing birds for reintroduction into their natural habitats. Over the years, the program at Patuxent has naturally transitioned to a more operational role of producing chicks for reintroduction. With other institutions capable of filling that role, the USGS has transferred the birds to organizations in North America interested in continuing the captive breeding and reintroduction efforts, allowing the USGS to focus its resources on other species at risk and in need of scientific research. 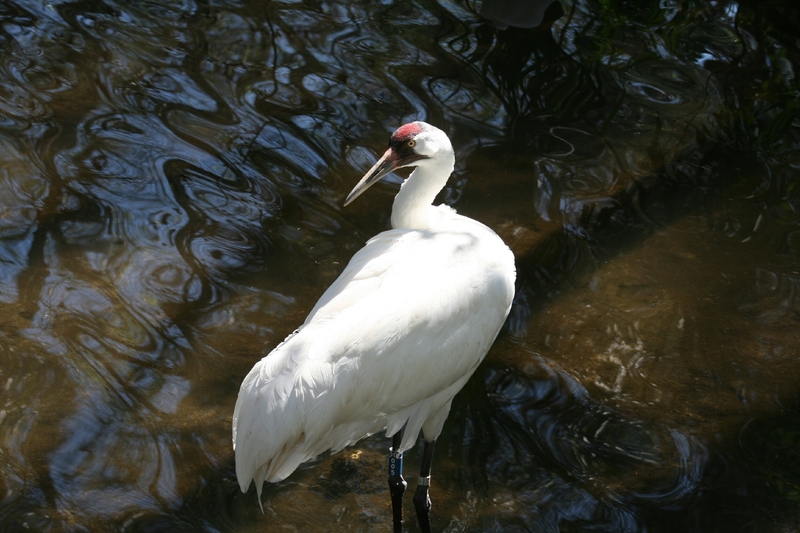 Whooping cranes are North America’s largest bird and a longtime symbol of the American conservation movement. They are native to North America and their current population is estimated at more than 700 birds. In 1942, the entire population declined to 22 birds. 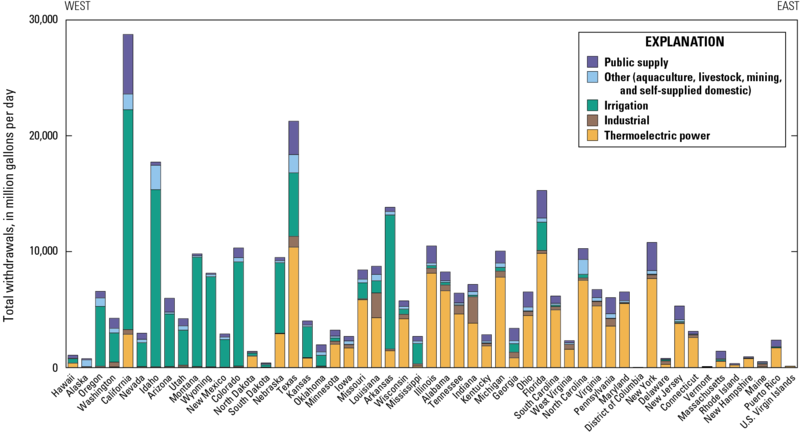 This decline was primarily due to human actions, such as overhunting and the development of shorelines and farmland that led to habitat loss. The captive breeding program began in 1967 when biologists from the U.S. Fish and Wildlife Service captured a young whooping crane and collected 12 eggs from the wild in Canada. All were sent to the Patuxent center, which was then under the USFWS. The center was transferred to the USGS in 1996. The overall conservation goal for the species has been to help establish new populations in places where the large, majestic birds once lived. 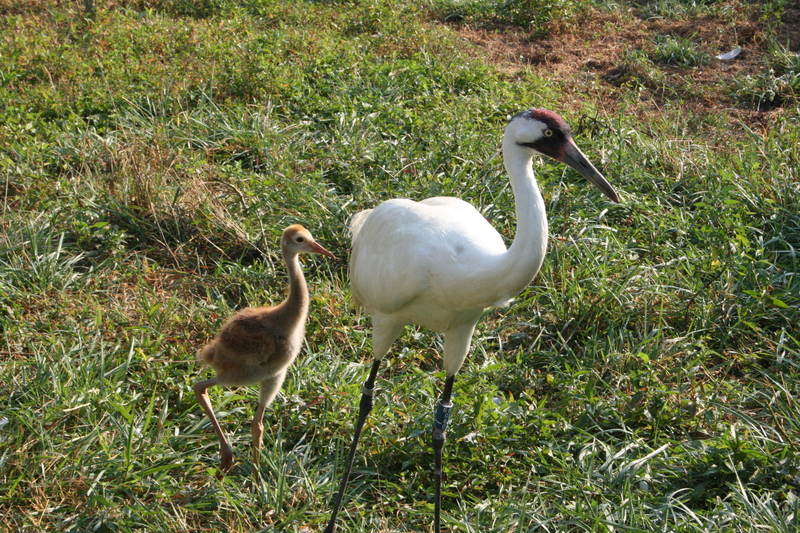 The Patuxent effort became the world’s largest whooping crane captive breeding program, and a model for science-based reintroduction of endangered species. Scientists sought ways to increase the number of eggs laid and chicks hatched. In the wild, whooping cranes typically lay two eggs at a time and only one clutch (group) per year. If the eggs don’t survive or are lost to predators, a whooping crane may lay a second or even a third clutch that year. In captivity at Patuxent, scientists removed eggs from the parents’ nests for incubation in the lab, which encouraged re-nesting and increased the total number of eggs and chicks produced. Sandhill cranes were often used to incubate the extra eggs. Methods developed at Patuxent for artificial insemination of breeding females have allowed the production of chicks with a healthy genetic heritage and allowed the preservation of genetic diversity in the captive flock. 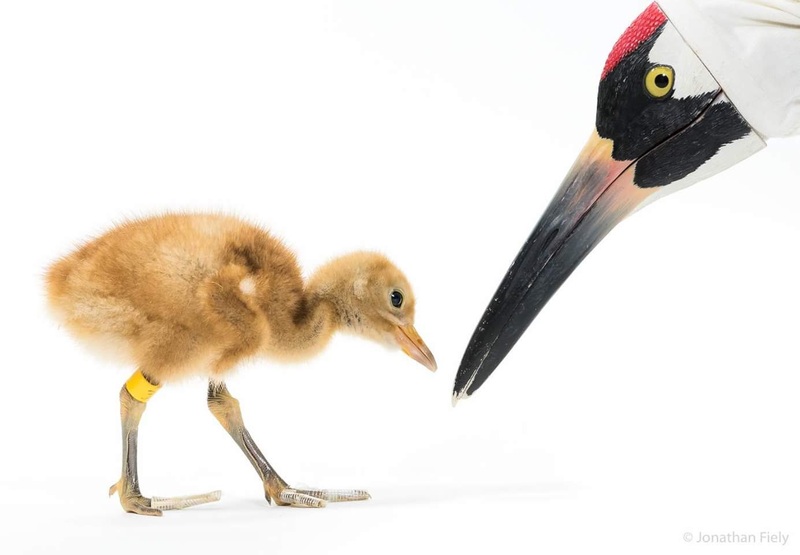 From the moment a whooper chick hatched, technicians interacted with them only when wearing a crane costume. Costumed technicians taught the chicks how to find food, purred or played brood calls to the chicks like their parents would, and introduced them to wetland habitats. The costume prevented chicks from imprinting on—or attaching themselves to—humans. This is especially valuable after release, as it is beneficial for the chicks to act as natural in their habitat as possible. Various methods were also developed for preparing whooping crane chicks for reintroduction to the wild. Federal scientists and partners developed and improved the method of training young crane chicks to follow an ultralight aircraft, which was used to teach the fledglings a migration route south for their first winter. Patuxent’s cranes were transferred to other institutions that can produce chicks for reintroduction. These institutions are the Smithsonian Conservation Biology Institute in Front Royal, Virginia; the White Oak Wildlife Conservation in Yulee, Florida; the International Crane Foundation in Baraboo, Wisconsin; the Dallas, Houston, Abilene and San Antonio Zoos in Texas; the Oklahoma City Zoo in Oklahoma; the Omaha Zoo in Nebraska; the Freeport-McMoRan Audubon Species Survival Center in Louisiana; and the Calgary Zoo and the African Lion Safari in Canada. 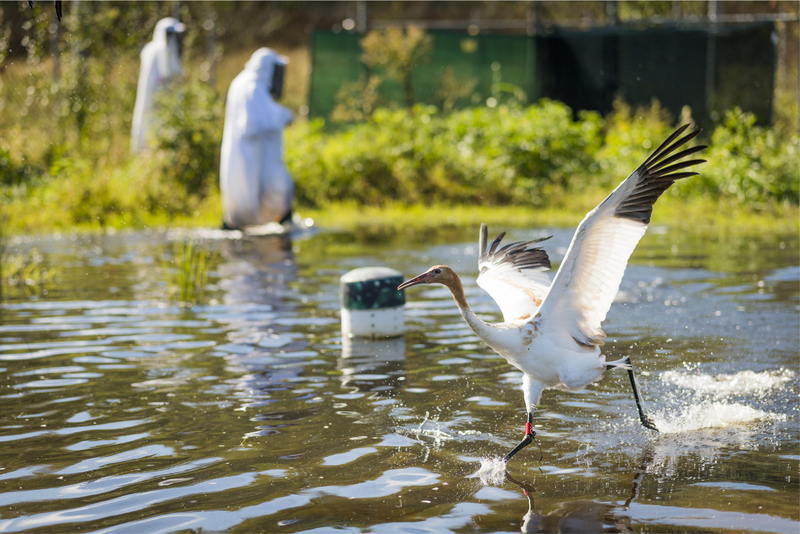 Whooping crane captive breeding for reintroduction in North America is one part of the strategy for conservation and restoration of the species. A joint U.S.-Canada International Recovery Team develops and guides the strategy for whooping crane management, which is detailed in the International Recovery Plan for the Whooping Crane. 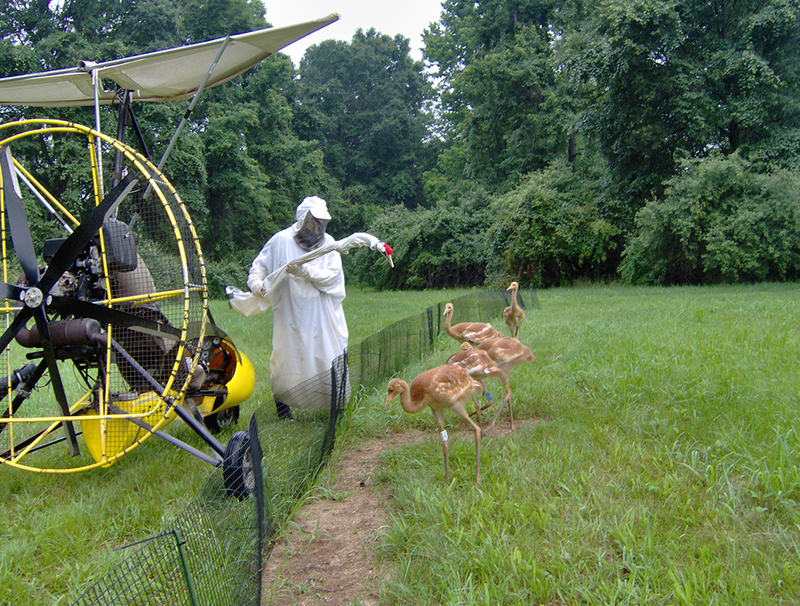 The team also oversees the management of wild and reintroduced populations of whooping cranes. Today, U.S. Secretary of the Interior Ryan Zinke joined Paul C. Johnson, president of Colorado School of Mines, to announce a long-term partnership between the university and the U.S. Geological Survey (USGS). The partnership will bring more than 150 USGS scientists and their minerals research labs to the university’s Golden, Colorado, campus where government scientists and Mines faculty and students will work together in a new state-of-the-art facility. Johnson and Zinke were joined at today’s announcement by Senator Cory Gardner and Congressman Ed Perlmutter, as well as Mines Board of Trustees Chairman Thomas E. Jorden and Roseann Gonzales-Schreiner, USGS Associate Director for Administration and Acting Director of the Southwest Region. 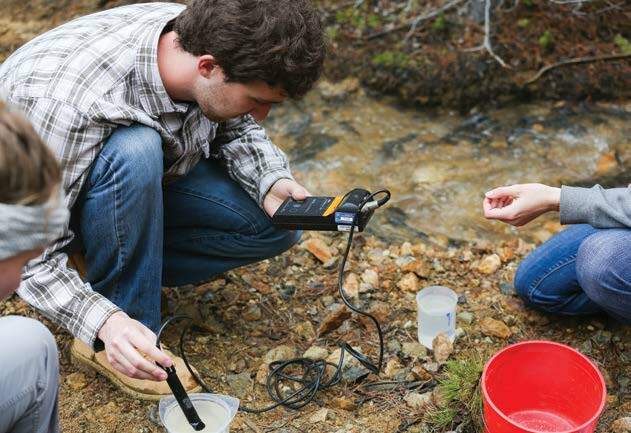 USGS and Mines, renowned for their expertise in the earth sciences and engineering, are expanding a long-standing relationship to catalyze even greater collaboration among USGS scientists and Mines faculty and students in the name of tackling the nation’s natural resource, security and environmental challenges, and exploring frontiers where the next innovations in earth and space resources, technology and engineering will occur. The relationship between Mines and the USGS goes back more than 40 years, with the USGS Geologic Hazards Science Center and its National Earthquake Information Center already calling the Mines campus home. The floodwaters that covered wide swaths of the Carolinas’ coastal plain are finally receding, more than two weeks after Hurricane Florence made landfall Sept. 14 near Wrightsville Beach, North Carolina, and U.S. Geological Survey hydrographers are moving in rapidly to the areas where the flooding lingered longest. About 30 flood experts are in the second week of a high water mark campaign, traveling from one hard-hit community to the next, searching neighborhood by neighborhood and sometimes door to door for physical evidence of flooding. Double-checking a high water mark on a church door near Maxton, NC September 2018 via USGS. The USGS experts are looking for telltale lines of seeds, leaves, grass blades and other debris left behind on buildings, bridges, other structures and even tree trunks as floodwaters recede. Once they find these high water marks, they label them, photograph them, survey them, and record crucial details about them. Why is this fieldwork important? The physical signs of flooding provide valuable information that can confirm or correct other lines of evidence. Among these are measurements from a network of about 475 permanent and temporary river and streamgages that were in place in North and South Carolina when Florence struck; more than 175 stream and river flow measurements taken by field crews after the storm on flood-swollen rivers, streams and even roads; satellite photos and imagery from unmanned aerial vehicles (or drones); and computer modelled flood projections. Taken together, all this evidence will allow USGS experts to reconstruct precisely where, when, at what depth, and in what volume floodwaters inundated the region. 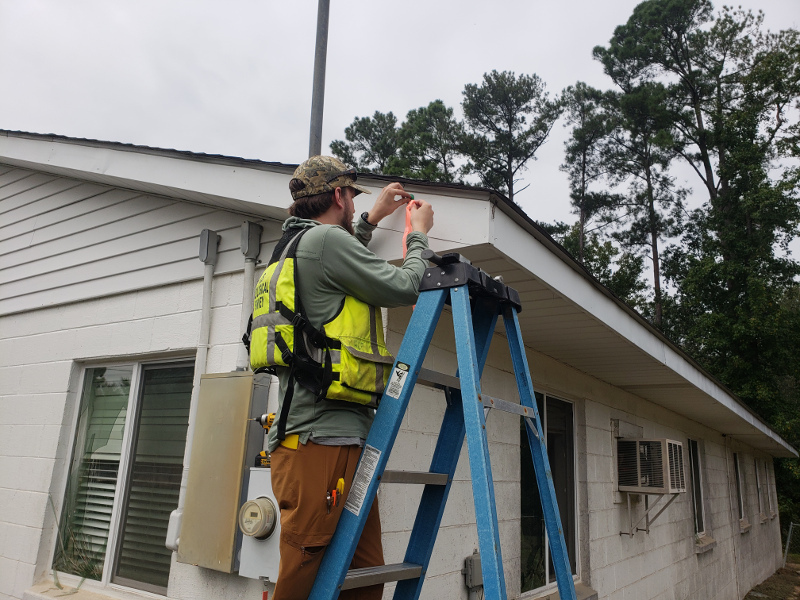 USGS hydrologic technician Rob Forde flags a high water mark above the eaves at Presbyterian Church of the Covenant in Spring Hill, NC in the wake of flooding brought on by Hurricane Florence. Credit: Kagho Asongu, USGS. Public domain. Right after the storm, the USGS’ early information from high water marks can help emergency managers decide where to locate relief centers, so that aid can reach the most severely affected communities quickly, and can help the U.S. Army Corps of Engineers manage flood control. In the coming weeks USGS flood information can help the Federal Emergency Management Agency to discern the difference between wind and water damage – important information for property owners and insurers. 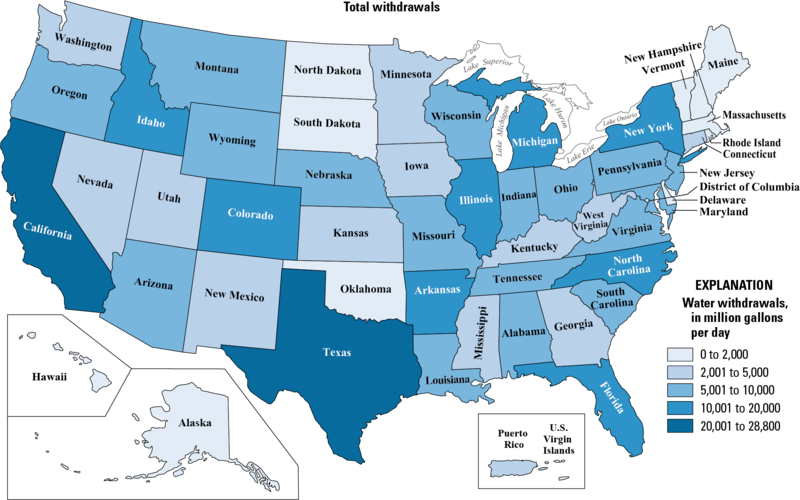 Over the long term, it can help emergency managers plan better for future floods; improve the computer models used by the National Weather Service to forecast flooding; and provide information used by FEMA to update the nationwide flood zone maps that underpin the federal flood insurance program. “I am proud of the USGS staff’s speed, thoroughness and accuracy as they do this essential work in difficult conditions, and under the pressure of time,” said USGS South Atlantic Water Science Center director Eric Strom. “The team began working well before Florence made landfall, when field crews began installing storm-tide sensors along the coast. Right after the storm passed, we mobilized as many as 60 people at a time to fix or relocate streamgages that were damaged or destroyed, monitor the flooding, and work with forecasters and emergency managers to get them the up-to-date flood information they needed. And now, because the rivers have receded so slowly, we’re in the midst of a long high water mark campaign in two states. Preliminary USGS data indicates that Florence’s heavy rains resulted in 19 water level records on rivers and streams in North Carolina and 10 records in South Carolina. Rivers that reached or exceeded the major flood stage heights forecast by the National Weather Service included the Cape Fear, Northeast Cape Fear, Neuse, Lumber, Waccamaw, Pee Dee, Little Pee Dee, Black and Lynches rivers. This flood event viewer, dated Oct. 3, 2018, shows the extent and type of information collected by USGS hydrologists in North and South Carolina in the wake of historic flooding brought on by Hurricane Florence. Credit: USGS. Public domain. The flooding in the Carolinas was long-lasting, with several rivers experiencing two peaks of high water flow or flood stage. The first one happened as local rainfall flowed into rivers and streams, and the second one came as rain that fell near the rivers’ headwaters worked its way downstream. In Goldsboro, North Carolina, about 100 miles inland from Florence’s landfall, the Neuse River escaped from its banks, crested at 27.6 feet on September 18, and lingered above the 18-foot flood stage mark for almost a week. The last two rivers to peak were both in South Carolina: the Little Pee Dee on Sept. 25 and the Waccamaw River on Sept. 26. NPS and USFWS use a seine net to trap humpback chubs in the Little Colorado River. Photo credit Mike Pillow via the Arizona Daily Sun. Glen Canyon Dam construction circa. 1961 via @USBR. Ted Kennedy, a U.S. Geological Survey aquatic biologist, led a recently concluded experimental flow that is raising optimism that the decline in insects such as midges, blackflies, mayflies and caddisflies can be reversed. Conducted under the long-term, comprehensive plan for Glen Canyon Dam management during the next 20 years, the experimental flow is expected to help determine dam operations and actions that could improve conditions and minimize adverse impacts on natural, recreational and cultural resources downstream. Western Water spoke with Kennedy about the experiment, what he learned and where it may lead. The transcript has been lightly edited for space and clarity. 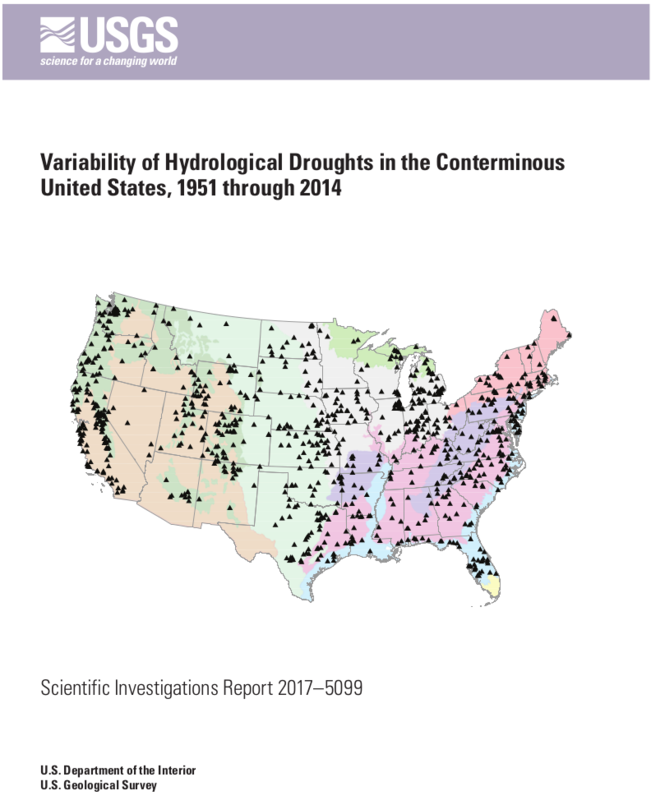 Spatial and temporal variability in the frequency, duration, and severity of hydrological droughts across the conterminous United States (CONUS) was examined using monthly mean streamflow measured at 872 sites from 1951 through 2014. 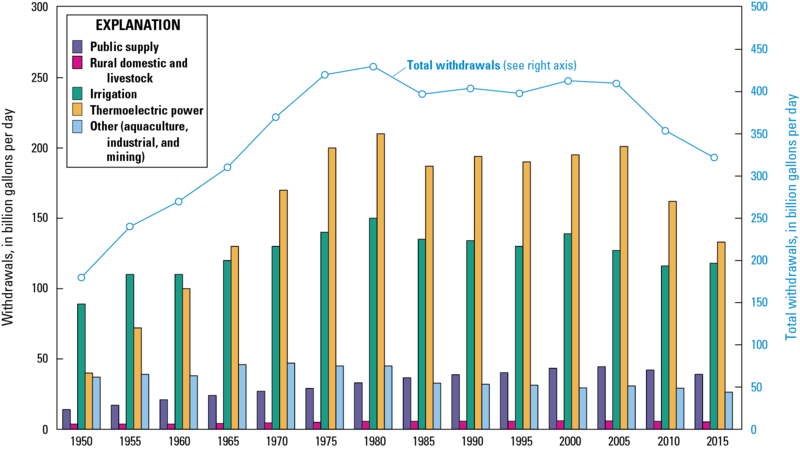 Hydrological drought is identified as starting when streamflow falls below the 20th percentile streamflow value for 3 consecutive months and ending when streamflow remains above the 20th percentile streamflow value for 3 consecutive months. Mean drought frequency for all aggregated ecoregions in CONUS is 16 droughts per 100 years. Mean drought duration is 5 months, and mean drought severity is 39 percent on a scale ranging from 0 percent to 100 percent (with 100% being the most severe). Hydrological drought frequency is highest in the Western Mountains aggregated ecoregion and lowest in the Eastern Highlands, Northeast, and Southeast Plains aggregated ecoregions. 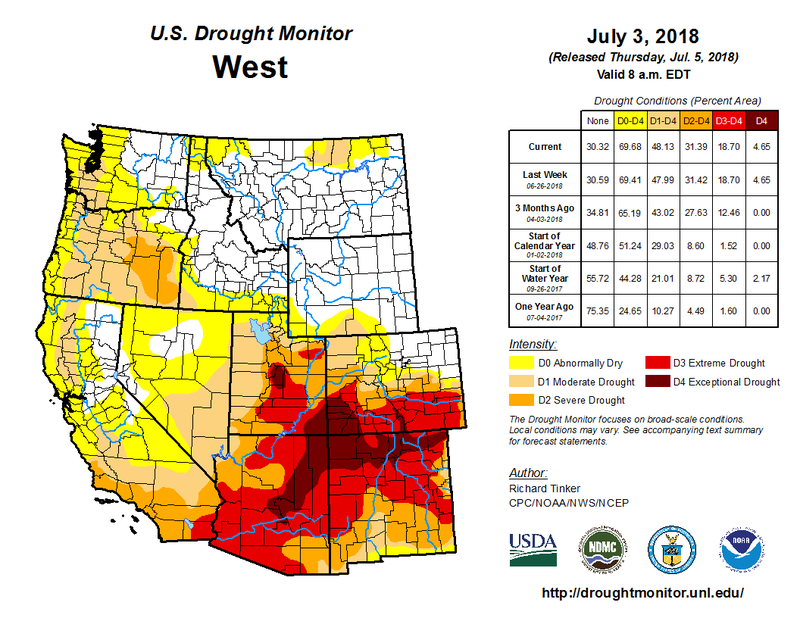 Hydrological drought frequencies of 17 or more droughts per 100 years were found for the Central Plains, Southeast Coastal Plains, Western Mountains, and Western Xeric aggregated ecoregions. Drought duration and severity indicate spatial variability among the sites, but unlike drought frequency, do not show coherent spatial patterns. A comparison of an older period (1951–82) with a recent period (1983–2014) indicates few sites have statistically significant changes in drought frequency, drought duration, or drought severity at a 95-percent confidence level.